Dining with Gorgeous Oceanfront Views! Stairway leads to loft with full size bed. Niulani Oceanfront Home, Kapaa, Hawaii. Kapaa, Kauai Oceanfront Vacation Rental. TAT ID#: TA-144-331-6736-01, TVNC: #1314. 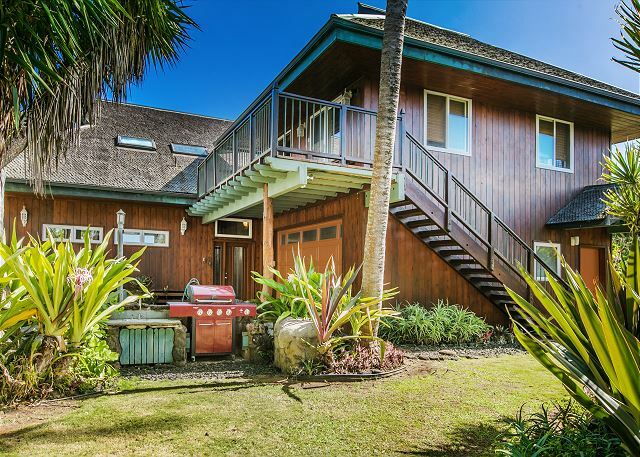 Conveniently located in Kapaa Town with direct access to the Ka Ala Hele Makalae Coastal Path. *ONLINE BOOKING IS FOR ENTIRE PROPERTY WHICH INCLUDES: 4 BEDROOM SUITES; 2 BEDROOM MAIN HOME + LOFT, 1 BEDROOM BUNGALOW, & 1 BEDROOM COTTAGE. SLEEPS UP TO 10. * 2 OR 3 BEDROOMS ONLY AVAILABLE FOR LAST MINUTE STAYS WITHIN 30 DAYS FROM BOOKING. May accommodate 10 with additional air mattress UPON SPECIAL REQUEST. 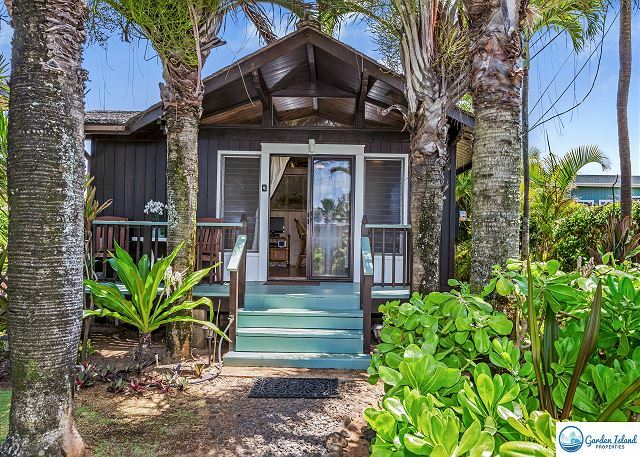 This home is walking distance to the Kauai Village Shopping Center, beaches, boutiques, the bike path, parks and more! 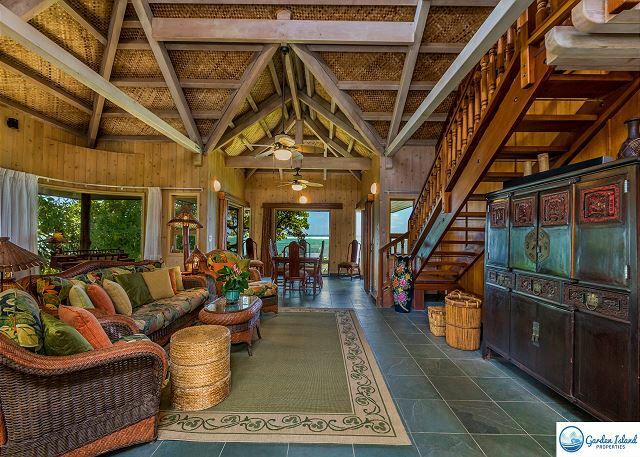 Lounge on your private outdoor deck and watch the moon and sunrises from this gorgeous beachfront Kapa'a home. 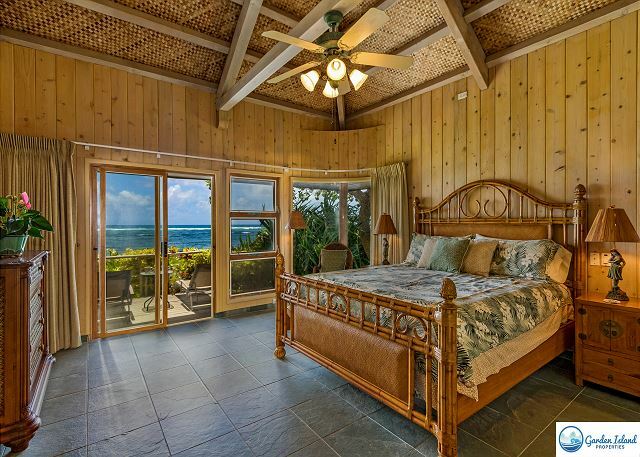 Master bedroom is equipped with a king size bed on the oceanfront side with sliding glass doors that leads out to the ocean side lanai and private marble lined bath/shower. The 2nd bedroom has a queen size bed. Loft bedroom over the living area in the Main Home is for additional sleeping and has a full size bed & dresser. This Hawaiian style oceanfront custom built home includes a total of 4 bedrooms and 4 baths plus a loft when renting ALL units. Outdoor gas BBQ grill area, beach chairs and washer and dryer are provided. 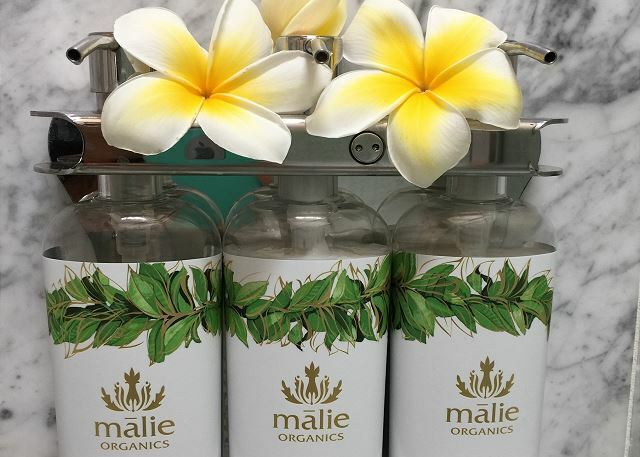 Complimentary Malie Organics shampoo, conditioner and body wash in each bathroom. 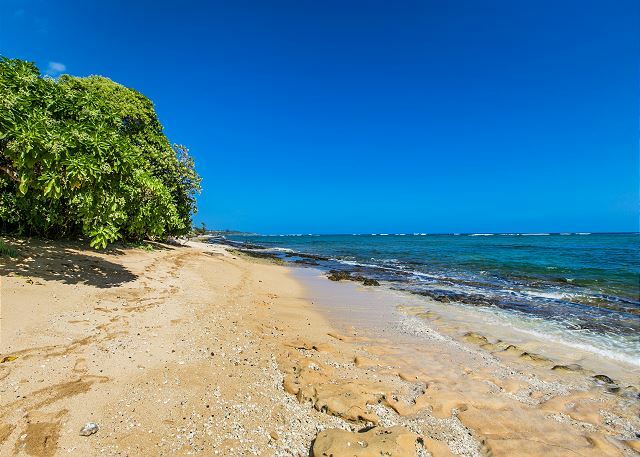 Stroll on to the beach in front of this lovely home or take a 5 minute drive to nearby Lydgate State Beach Park, Fern Grotto, Kamalani Playground, Wailua Golf Course or just rent a kayak and paddle up the Wailua River; the largest navigable river in the State of Hawaii. Enjoy the local foods of Hawaii with your custom made BBQ grill in your own back yard. 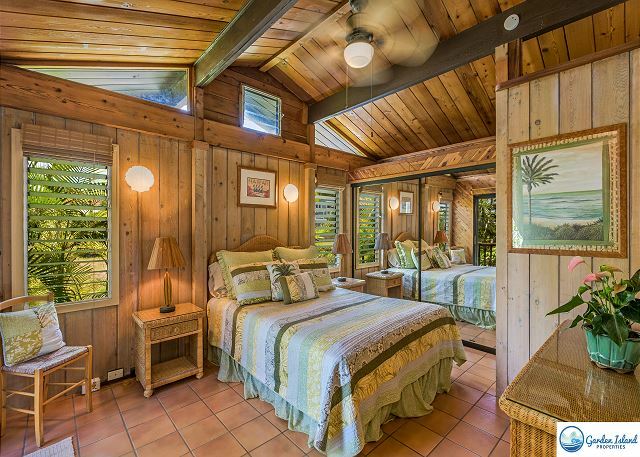 Niulani Beach Home is centrally located between Anahola, Kilauea, Hanalei and Haena to the North and Poipu Beach, Waimea Canyon and Kokee Park to the south/west of Kauai. Cozy for 2 or large enough for a family getaway! Walk to one of the many fabulous restaurants nearby for an evening dinner or stroll over to one of 2 major grocery stores, health food store and cafe, pharmacy, DVD rental or internet cafe. **The Beach Bungalow (above garage) is a 1 bedroom, 1 bath unit with a separate living area, full bathroom with marble lined shower, TV & DVD player, Queen bed. Bungalow area is approximately 500 square feet. **The Beach Cottage is a detached one bedroom, one bath with a separate living area, queen bed, private bath, TV, refrigerator and living area with TV & DVD player. 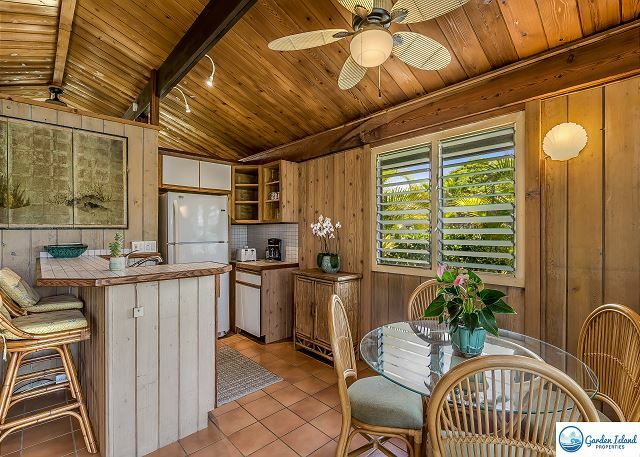 Cottage area is approximately 500 square feet and has a front porch and small lanai off the main bedroom. HOLIDAY RATES APPLY 12/15 - 1/5 WITH A MINIMUM NIGHT STAY. 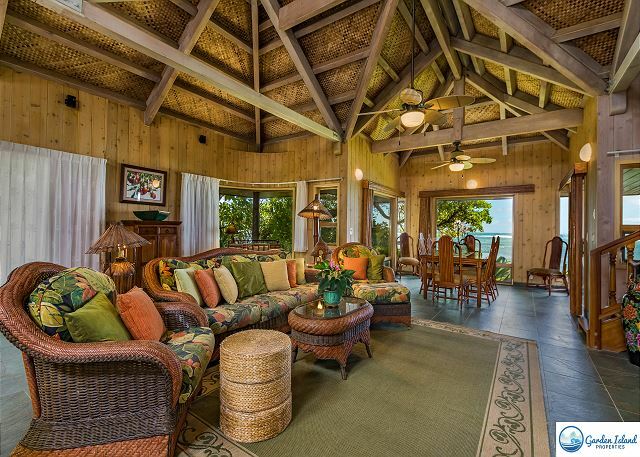 This is a wonderful house in a fantastic location in Kapaa. Not only are you on the ocean, but on a quiet street one block away from many stores and restaurants. We walked to Tiki Taco (great) bike rental (a 5.5 mile ride north along the ocean that was fantastic) grocery and other stores. This is a fabulous location and the house is great too. Would definitely rent this house again. 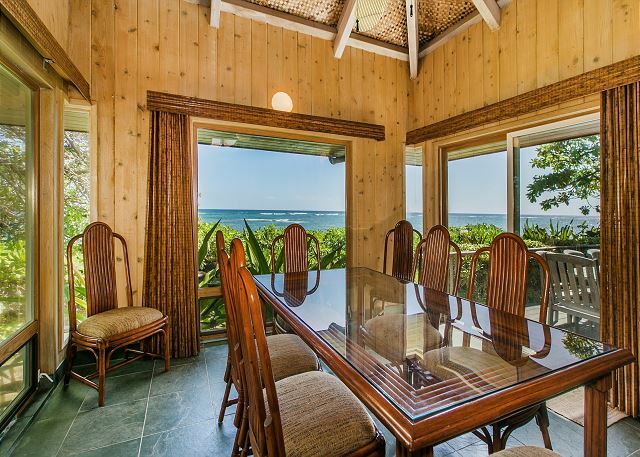 excellent location, walking distance to kapaa town and close to all the activities we had scheduled. we had some problems with the windows, which I notified the office about. the fans came in handy to help cool down the home after we returned from our activities. a few of the places we ate at were home cooking, chicken in a barrel. we picked up poke from foodland, which was good but missed eating at pono market since they were on vacation.but overall we were very satisfied with the accomadations and the beauty of Kauai. What a week! We stayed in this house with the entire family of 12, from children, grandchildren and significant others. The house is well equipped. Nice to see sand toys and water shoes, pack and play.Location was amazing. We would wake up in the morning and watch the sunrise. It is a good sized house that is comfortable and homey. The grill was a nice addition. Kitchen and family room were so big and airy. The fans were appreciated The house was well equipped. The Garden Properties personell were so easy to deal with. They were very responsive and helpful. Everything went seamlessly from the check in to the check out. Amazing stay, with wonderful memories. We have recommended this home to our friends and we will be back. The home was a perfect answer for our party made up of three couples and one single travelling together. The three buildings making up the complex allowed for everyone to be together and yet still have their own space. The main house is well equipped and comfortable. The back deck has a gorgeous view of the ocean, perfect for viewing the spectacular sunrises and the rising of the moon (which was full during our stay). Our biggest issue with the Bungalow (above the garage) was it had no mini-refrigerator or microwave - both of which are much needed at times, particularly the refrigerator - we spent much time running back and forth between the main house to get cold drinks. The Cottage had a huge refrigerator but no microwave. The house was located walking distance to shopping/dining in Kapaa - and walking is preferable at times due to the horrendous traffic in both directions on the main road through town. We were a bit surprised to find the home in as densely populated an area as it was - not clear from the description or the pictures of the property. But, overall, we had a perfect Hawaiian experience and would do it all again. The home was quite beautiful and worked very well for our family. Gorgeous views and yes, right on a nice little beach. We were there end of August 2018 and the heat and humidity made sleeping a bit tough for us given the lack of air conditioning. However we new the house did not have this when we rented it. House location is Perfect! We rented bikes for a week in Kapaa for $65.00 a week and spent many hours cruising up and down the bike path to great beaches and towns!The last half of our trip was dominated by the threat of oncoming Hurricane Lane. I can not say enough how GREAT and ATTENTIVE Kamani was in updating and communicating with us!!! We felt well cared for and watched after. Thank you so so much!!! Perfect house for multiple families. The location was amazing with a small beach in the backyard and restaurants and shopping nearby. The house was well supplied and clean. The location and house were perfect. Couldn't have had a better location - right on the beach with the bike path right there as well. Loved the main house decor and it had more than enough space for us 4 adults and 2 children. Property management was excellent and a pleasure to work with. The only tips I have for improvement is to replace the stove knobs (hard to read) and maybe one more fan in the cottage as it gets a tad hot w/limited ventilation. Other than that, we LOVED it and hope to return again soon. Mahalo!! We were traveling with two of our children and their families. The accommodations provided a perfect set-up for the 3 families. We were all together yet the cottage and bungalow offered us each our own private space. The location worked out for us as well. Some of our group appreciated the fact that we were within walking distance to the shops and restaurants of Kapa’a. Also we found it conveniently centrally located between the activities on the north and south shores. Seamless experience as far as home access/entry. When we arrived (less than a half hour early for the check in of 4:00 pm) the cleaning staff and a handyman were still completing their turnover duties, which ended up taking well past the hour. The place was as advertised in terms of rooms and beds. The attached apartment over the garage had a tiny flat screen TV which did not work insofar as being able to access a channel guide or identify any channels. The "beach" on which the house sits is a thin strip of sand not truly amenable to use, with a very rocky bottom under water. It was close to Kapaa town and shopping center. It is also on the 6 mile shoreline walking/hiking trail which is great for sightseeing/exercise. Overall a positive experience and would recommend. The pictures made the house look great and the reality exceeded the photography. The house was well appointed for six of us with plenty of fluffy towels and a working kitchen. We ate most of our meals in the house and they were lovely. The beach accessories in the laundry room were a nice find and saved us some time and money. The bike/pedestrian path in front of house that extended 2-3 miles in each direction was wonderful. As was ability to walk to town and other shopping/eating. The broker was very responsive to inquiries and problems.A few gripes. Description should disclose that only the master bedroom has an ocean view. The cottage and upstairs unit are not as well maintained and had some relatively small issues (e.g., a squeaky bedroom ceiling fan and a central living light that couldn't be used because the pull cord was broken). The kitchen would have benefited from a few more items (napkins, storage bags, fresh salt and pepper). The number and amount of the various fees and taxes makes the VRBO nightly rate misleading -- raise the listed rate to include some of the fees. GPS directions from airport led to wrong end of street; warn people that GPS may give wrong turnoff from the highway. Traffic on the highway is very busy (and we were there on off season). This was a beautiful home at one time but has seen better days. It is a good configuration for larger parties with plenty of bedrooms and baths. Large kitchen where several can work comfortably. A great laundry room with washer/dryer and a large utility tub. Here's what we found could be improved. The kitchen stovetop worked but the dials are worn so hard to figure out temperature. Barbecue also had regulator control issues; no mid flame range. Furniture is quite faded. Main television had sound issues and no mute button; and this was during Olympics! The window openers are worn out on a lot of the windows. Some did not even open. Hot water takes a long time to get hot. The style of the home is lovely. The high ceilings were awesome. Beds were comfy as were the pillows. Well equipped kitchen, as well as lots of nice towels. Appreciated the ocean front deck and furniture. It could be an exceptional house if a few upgrades! Finally, location was good. We walked most places and the best walking path right in front. 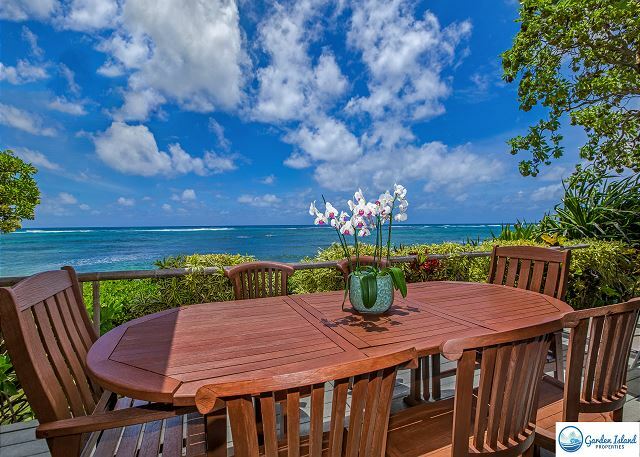 We were absolutely thrilled with the location of the Niulani Oceanfront Home. We took advantage of the walking/bike path that was right outside our driveway nearly every day. 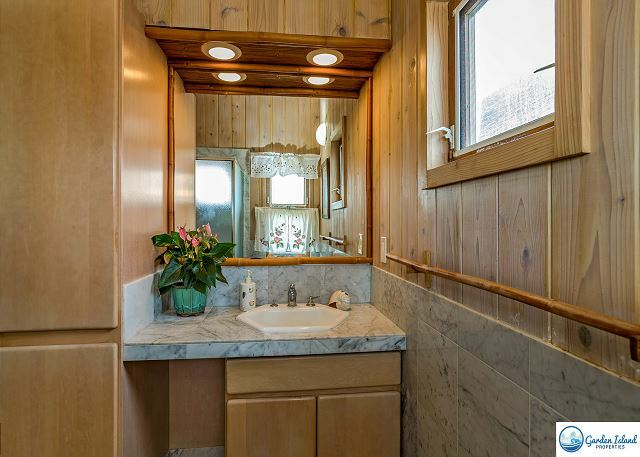 The home was clean and had every convenience that you could possibly need for your vacation. Beach toys and chairs, well appointed kitchen, comfy beds with quality sheets and lots of space to spread out. The size of the kitchen made meal prep a breeze and when we didn't feel like cooking- Kauai Pasta was just a couple of blocks away. Wednesday night Happy Hour at the next door Oceans restaurant and bar provided outstanding ukulele concert. (get there early to get a table). The Property Management company was extremely responsive and the gift of a huge fruit basket was an unexpected treat. Wednesday at 3pm is the Kapaa farmers Market. Not to be missed. The proximity to Lihue Airport is wonderfully convenient. The house is directly on the beach. I would worry about small children and frail adults as the tide comes up to a bank which is a bit difficult to navigate. As we had no problem, it was wonderful to watch the sun rise directly on the water and go wade in the water whenever we wanted. Very comfortable beds but polyester sheets which were a bit hot. Towels and equipment were very nice. The main living space was spectacular and the kitchen was well stocked and easy for several cooks to work in at once. We would definitely recommend Niulani. Excellent location ON the beach and near stores. Big, roomy home with space and privacy for a large family. Lots of little extras like laundry products, beach towels and chairs...make vacation enjoyable. Issues: no air conditioning-if you can’t handle heat and humidity with a fan this house is not for you. It does cool off nicely for a few hours before dawn but not enough to sleep well. It’s the prime reason we would not rent it again. We had a child, a pregnant woman, and a grandma who struggled with it. The beds are FIRM. 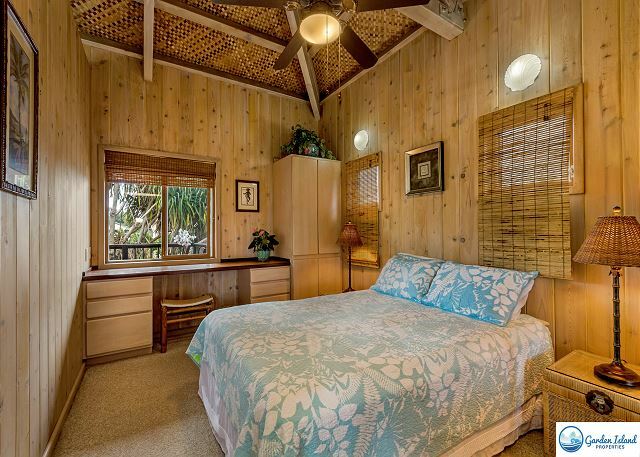 If you like that, you will be ok.
AlohaI rented the main home and beach cottage. The place was wonderful and fully stocked. Enjoyed the homes location in Kapa’a. The rental company was organized and very responsive. Nothing could have been better. All was absolutely wonderful. Thank you for a memorable experience. This place was spectacular. We loved everything about it. Very good. Fantastic location. Enough room for 7 of us. Only critique, which don't think there is much the owner can do except by remodeling, is the backbedroom and lodge above garage bedroom feel stifled, not enough ventilation. Would help if you had bigger windows so can let more air in. Otherwise, the stay was perfect. Honestly felt like paradise when we walked in. This place is bigger than we thought it was going to be. The beach is small but really delightful with the small crabs that walk around. Everything was clean when arrived and quite wonderful. It does get a bit warm so make sure you open all the windows for that ocean breeze. This kitchen was spacious and the dining area was surrounded by windows. We utilized the cottage as well and that worked out great. We did hang a lovely hammock we had brought from home on the beach and had some small items out there overnight and everything was stolen so don't leave anything near the beach. I would think people would have integrity but obviously they needed it more so beware. Secure all items. Other than that it was nice, breezy place to stay. It is totally worth it to be right on the beach and to hear those ocean waves. 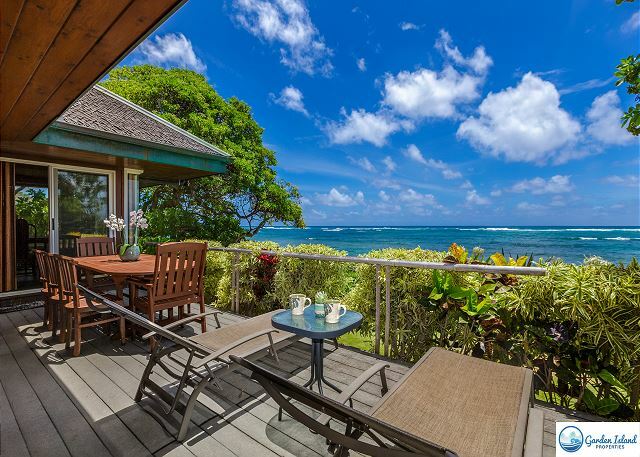 This oceanfront home has a beautiful view from the lanai and all of the amenities you could want. A huge entertaining kitchen is a plus, as is the "island" decor inside-- it's just a beautiful home. 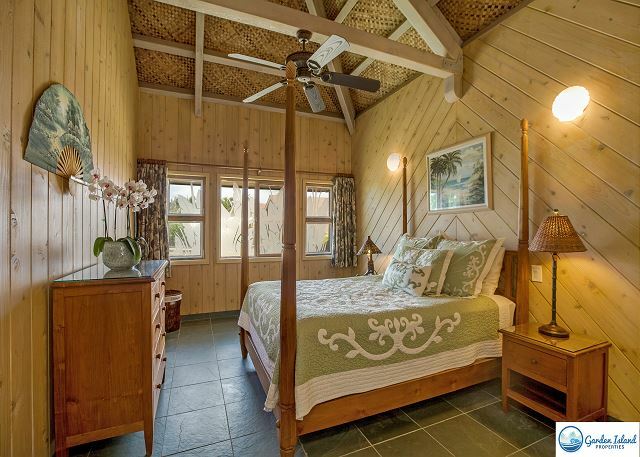 We also rented the cottage, which was really nice too--it has two lanais, and you can hear the ocean from the one off the bedroom. It was nice for one of the couples to have their own space. The only quibble is that the beachfront is not a swimming beach-- beautiful to look at but you can't really get in it. Really rocky and dangerous. But we rented bikes for the week (there's a place right on the corner to do that) and about 15 minutes up the bike path there's a wonderful swimming and bodyboarding beach: Kealia. There are other swimming beaches closer but that one was our favorite. Also the cute town of Kapaa is walking distance (and really close by bike)--lots of shops and restaurants. The ride to the end of the bike path by Donkey Beach is breathtaking as well. 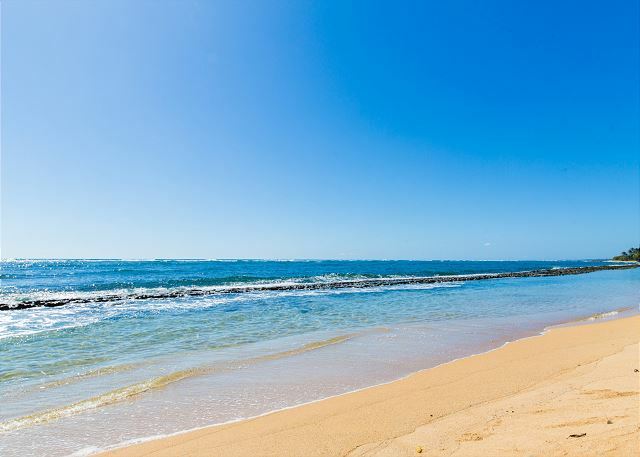 Other pluses: It's only 20 minutes from the airport; very handy to get to Poipu and the South Shore; not too far from the North Shore either. Very convenient for driving all over the island. Overall we loved our stay here and would come back in a heartbeat. Property as described. We had an excellent stay at the property. We rented the main property + the Bungalow and loft. The kitchen was very well equipped, the beds were comfortable and the house was kept very clean and the property itself was very well cared for. We did alot of swimming off the small beach (you need swimshoes and we used swimfins often). The beach is protected by a reef about 1,000 feet offshore, so the waves weren't too bad at all. We also enjoyed the paved bike bath that is by the property and runs a few miles up the coast. Kappa is a great town to vacation with shopping, restaurants and many great food trucks! The property firm was also excellent to deal with. Very responsive. We just stayed at the house (not the other units) and loved it. Great location for getting around the whole island. It was quite (not counting the surf crashing) despite being one block off of the highway. Checking in and out could not have been easier. 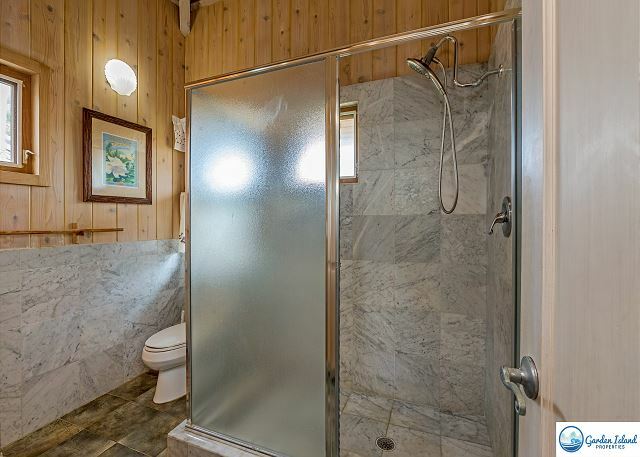 One minor complaint was that the 2nd BR was hot and stuffy even with the fans, and there was no privacy from the neighbors next door. We fell in love with this house! It is literally just a few steps away from the beach and yet wonderfully close to everything! We didn't spend much time there as there is so much to explore on such a little island but we were out on the deck or the beach almost every evening and watched the perfect sunrise either laying in bed (right out the master window) or eating breakfast on the deck. We were worried about no a/c but it was definitely not a problem. The kitchen was well stocked though we wished they had plastic as we had kids and were worried about breaking dishes. The kitchen had everything we needed. The upper level is just a bed and dresser which we were assuming there was more but it worked perfect for the kids. My parents stayed in back house and loved it! perfect for the 2 of them. Overall the house was just what you want for a beach house, beautiful and unique without being stuffy. Tons of character and charm. The location of this property is perfect. 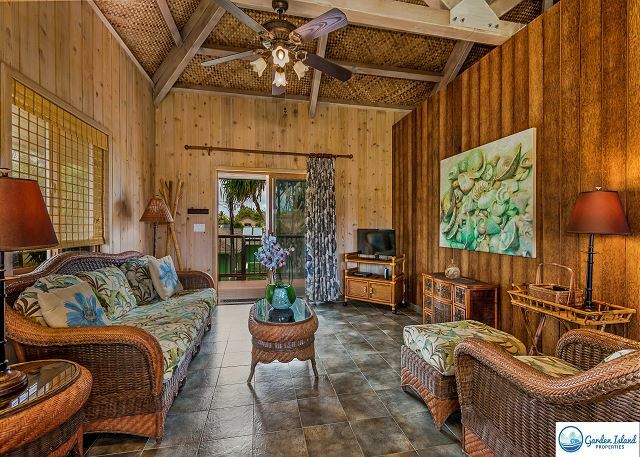 Right on the beach, within easy walking distance to Kapaa town and the popular Kauai Path. The house was very comfortable and with the option to rent the bungalow and cottage on the property, you can easily accommodate 4 couples with plenty of room. The beach house has a nice open floor plan to allow the entire group to gather for meals and socializing. Great deck area for whale watching. The upstairs loft in the beach house is very small and offers no privacy so we did not use that area, but it may work okay for older children if needed. Probably would not recommend for younger children since there are stairs involved. There was a mix up when we arrived so the cottage and bungalow were not ready for rental. This was quickly remedied by the rental agency. I would definitely recommend this property if you are looking for a place on the east side. We stayed over Thanksgiving week 2016. We rented the main house as well as the room above the garage. The house was wonderful. Everything we needed, we found. Everything was clean. There were a lot of beach options - toys, water shoes, towels, etc, to bring to the beach. The beach along the house is narrow and not really usable. That said the view is awesome! The location was great as it was a quick walk or drive to the store or restaurants. I would highly recommend this house. This was a great house. Our extended family of 6 people (5 adults-1 toddler) were very comfortable in this beachfront home. It's perfect location is steps away from the beach and just a couple blocks to groceries, coffee and ice cream. It's also a great home base to be able to explore the entire island. The home has all the beach gear you need (towels, chairs) and other amenities (cable, internet, bbq grill). The management company is friendly and willing/able to assist if you need them. I don't consider this a downside as we expected it but the house does stay warm at night (humidity/august) but we let the ocean air and the fans provided to keep us cool. We hope to come back and rent the rest of the property for a larger group/family gathering. We rented the house, the cottage and the bungalow for 10 days. There were eight adults and 2 children, and we had plenty of space, and loved the property. The description was very accurate, but even nicer than we imagined. It was very clean and well-maintained. We all love to cook, and enjoyed cooking in the beautifully appointed kitchen. Everything one could possibly want in a beach house was provided: sand shoes, beach toys, chairs, towels, umbrella, and even some snorkel gear. An added bonus was the laundry room, with laundry soap provided. We snorkeled, scuba dived, zip-lined, hiked, explored Waimea canyon, sunbathed, and took an Odessey trip along the Napali coast. Our kids took us to a luau on a plantation but I've forgotten the name of it. We also ate at Shrimp Station and the Beach House Restaurant, all good. The location is very convenient---we went all the way to Barking Sands beach on the southwest, and all the way north as far as we could. We had a great time. It worked out well for our family of nine. Besides my husband and myself, we had three adult children, their spouses plus one grandchild in our party, so the addition of the bungalow and cottage were perfect for us. We saw whales from the deck and the house is located on a walking/bike path which was nice. The baby beach that was located very near the house was not the cleanest, the sand was littered with debris. However we did get to enjoy watching two Monk seals that came and rested on the beach each day. The volunteers that kept people from getting to close were friendly and great to visit with each day! Garden Island Properties also allowed us a late check out which was really appreciated since our flight did not leave until 11:00 at night. This made our last day on the island much more enjoyable. Because the house is right on the beach that was not frequented by people, there was a lot of privacy. At the same time, it was very close to stores and restaurants on the main road so it was very convenient. We did not hear any road noise. The only constant noise was the ocean waves. It was awesome. Some of the windows were difficult to open but other than that, we have no complaints. I would be very happy to move in permanently. Great location and ambiance. We stayed at the house for a week this January. 6 adults and 3 kids. We were very happy with our choice. The house is amazing. Very nice large kitchen for the entire group. Plenty of space in the house and quite kid friendly. You are only a chip shot away from the beach. Which we were thrilled with. The sand was perfect for the kids. Not a beach where kids can wade in but a baby beach is a couple minute walk to. We went there once because we loved ours. Snorkeling/swimming(with water shoes)/paddle boarding is great right there. Everything you need is a short walk/drive away. 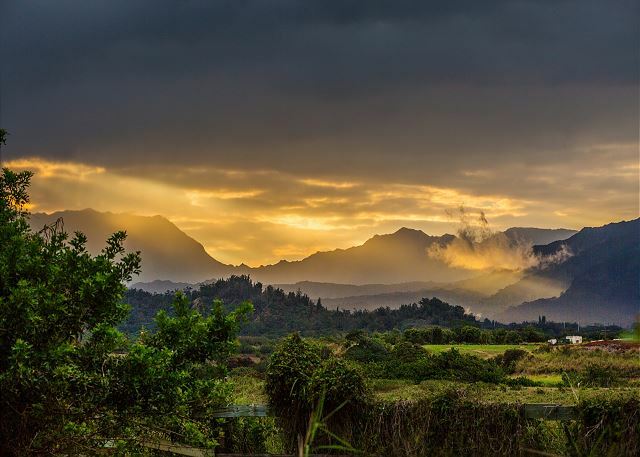 Kauai is paradise and we will be heading back and this place will be first on our list. Can't wait. Mahola from our family! We rented this beautiful property while in Kauai for a wedding. It was the perfect place to gather and watch the sunrise or to go snorkeling with the gear provided at the house. The kitchen was well stocked and it was close to everything we needed. Thanks! The house and location was excellent. the beds and pillow were substandard- particularly the master. It was like sleeping on a rock!! it made it hard to love the rest - but it was really nice. the upstairs apartment felt like furniture was missing. Very nice home and lovely beach. Worked extremely well for our family. Well stocked with beach chairs and towels. Would rent again. 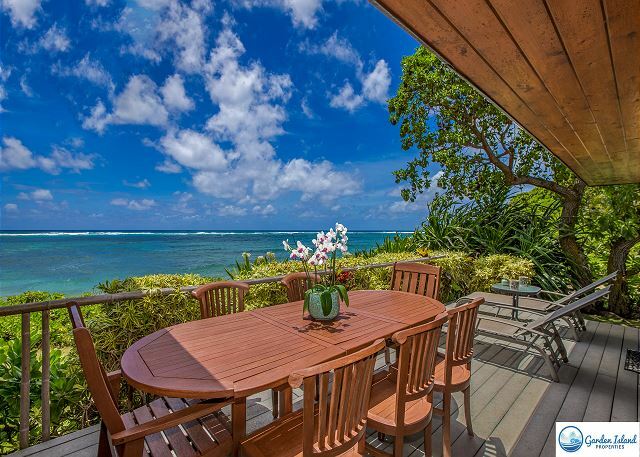 [Description] => Niulani Oceanfront Home, Kapaa, Hawaii. Kapaa, Kauai Oceanfront Vacation Rental. TAT ID#:  TA-144-331-6736-01, TVNC: #1314. Master bedroom is equipped with a king size bed on the oceanfront side with sliding glass doors that leads out to the ocean side lanai and private marble lined bath/shower. The 2nd bedroom has a queen size bed. => Dining with Gorgeous Oceanfront Views! => Stairway leads to loft with full size bed. 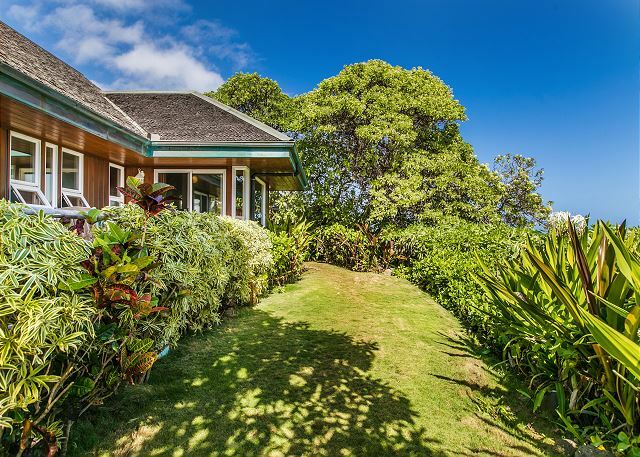 [review] => This is a wonderful house in a fantastic location in Kapaa. Not only are you on the ocean, but on a quiet street one block away from many stores and restaurants. We walked to Tiki Taco (great) bike rental (a 5.5 mile ride north along the ocean that was fantastic) grocery and other stores. This is a fabulous location and the house is great too. Would definitely rent this house again. 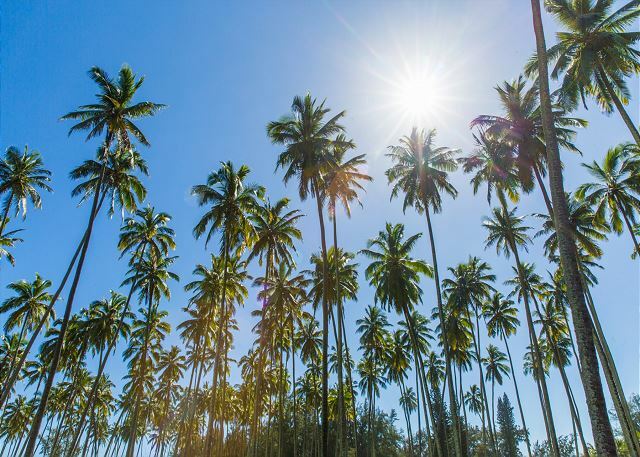 [review] => excellent location, walking distance to kapaa town and close to all the activities we had scheduled. we had some problems with the windows, which I notified the office about. the fans came in handy to help cool down the home after we returned from our activities. a few of the places we ate at were home cooking, chicken in a barrel. we picked up poke from foodland, which was good but missed eating at pono market since they were on vacation.but overall we were very satisfied with the accomadations and the beauty of Kauai. [title] => Steps to the beach! [review] => What a week! We stayed in this house with the entire family of 12, from children, grandchildren and significant others. The house is well equipped. Nice to see sand toys and water shoes, pack and play. Location was amazing. We would wake up in the morning and watch the sunrise. It is a good sized house that is comfortable and homey. The grill was a nice addition. Kitchen and family room were so big and airy. The fans were appreciated  The house was well equipped. The Garden Properties personell were so easy to deal with. They were very responsive and helpful. Everything went seamlessly from the check in to the check out. Amazing stay, with  wonderful memories. We have recommended this home to our friends and we will be back. [review] => The home was a perfect answer for our party made up of three couples and one single travelling together. The three buildings making up the complex allowed for everyone to be together and yet still have their own space. The main house is well equipped and comfortable. The back deck has a gorgeous view of the ocean, perfect for viewing the spectacular sunrises and the rising of the moon (which was full during our stay). Our biggest issue with the Bungalow (above the garage) was it had no mini-refrigerator or microwave - both of which are much needed at times, particularly the refrigerator - we spent much time running back and forth between the main house to get cold drinks. The Cottage had a huge refrigerator but no microwave. The house was located walking distance to shopping/dining in Kapaa - and walking is preferable at times due to the horrendous traffic in both directions on the main road through town. We were a bit surprised to find the home in as densely populated an area as it was - not clear from the description or the pictures of the property. But, overall, we had a perfect Hawaiian experience and would do it all again. [review] => The home was quite beautiful and worked very well for our family. Gorgeous views and yes, right on a nice little beach. We were there end of August 2018 and the heat and humidity made sleeping a bit tough for us given the lack of air conditioning. However we new the house did not have this when we rented it. House location is Perfect! We rented bikes for a week in Kapaa for $65.00 a week and spent many hours cruising up and down the bike path to great beaches and towns! The last half of our trip was dominated by the threat of oncoming Hurricane Lane. I can not say enough how GREAT and ATTENTIVE Kamani was in updating and communicating with us!!! We felt well cared for and watched after. Thank you so so much!!! [title] => Perfect house for multiple families. [review] => The location was amazing with a small beach in the backyard and restaurants and shopping nearby. The house was well supplied and clean. [review] => The location and house were perfect. Couldn't have had a better location - right on the beach with the bike path right there as well. Loved the main house decor and it had more than enough space for us 4 adults and 2 children. Property management was excellent and a pleasure to work with. The only tips I have for improvement is to replace the stove knobs (hard to read) and maybe one more fan in the cottage as it gets a tad hot w/limited ventilation. Other than that, we LOVED it and hope to return again soon. Mahalo!! [review] => We were traveling with two of our children and their families. The accommodations provided a perfect set-up for the 3 families. We were all together yet the cottage and bungalow offered us each our own private space. The location worked out for us as well. Some of our group appreciated the fact that we were within walking distance to the shops and restaurants of Kapa’a. Also we found it conveniently centrally located between the activities on the north and south shores. [name] => Janice M H.
[review] => Seamless experience as far as home access/entry. When we arrived (less than a half hour early for the check in of 4:00 pm) the cleaning staff and a handyman were still completing their turnover duties, which ended up taking well past the hour. The place was as advertised in terms of rooms and beds. The attached apartment over the garage had a tiny flat screen TV which did not work insofar as being able to access a channel guide or identify any channels. The "beach" on which the house sits is a thin strip of sand not truly amenable to use, with a very rocky bottom under water. It was close to Kapaa town and shopping center. It is also on the 6 mile shoreline walking/hiking trail which is great for sightseeing/exercise. Overall a positive experience and would recommend. [review] => The pictures made the house look great and the reality exceeded the photography. The house was well appointed for six of us with plenty of fluffy towels and a working kitchen. We ate most of our meals in the house and they were lovely. The beach accessories in the laundry room were a nice find and saved us some time and money. The bike/pedestrian path in front of house that extended 2-3 miles in each direction was wonderful. As was ability to walk to town and other shopping/eating. The broker was very responsive to inquiries and problems. A few gripes. Description should disclose that only the master bedroom has an ocean view. The cottage and upstairs unit are not as well maintained and had some relatively small issues (e.g., a squeaky bedroom ceiling fan and a central living light that couldn't be used because the pull cord was broken). The kitchen would have benefited from a few more items (napkins, storage bags, fresh salt and pepper). The number and amount of the various fees and taxes makes the VRBO nightly rate misleading -- raise the listed rate to include some of the fees. GPS directions from airport led to wrong end of street; warn people that GPS may give wrong turnoff from the highway. Traffic on the highway is very busy (and we were there on off season). [review] => This was a beautiful home at one time but has seen better days. It is a good configuration for larger parties with plenty of bedrooms and baths. Large kitchen where several can work comfortably. A great laundry room with washer/dryer and a large utility tub. Here's what we found could be improved. The kitchen stovetop worked but the dials are worn so hard to figure out temperature. Barbecue also had regulator control issues; no mid flame range. Furniture is quite faded. Main television had sound issues and no mute button; and this was during Olympics! The window openers are worn out on a lot of the windows. Some did not even open. Hot water takes a long time to get hot. The style of the home is lovely. The high ceilings were awesome. Beds were comfy as were the pillows. Well equipped kitchen, as well as lots of nice towels. Appreciated the ocean front deck and furniture. It could be an exceptional house if a few upgrades! Finally, location was good. We walked most places and the best walking path right in front. [name] => Jo and Jerry S.
[review] => We were absolutely thrilled with the location of the Niulani Oceanfront Home. We took advantage of the walking/bike path that was right outside our driveway nearly every day. 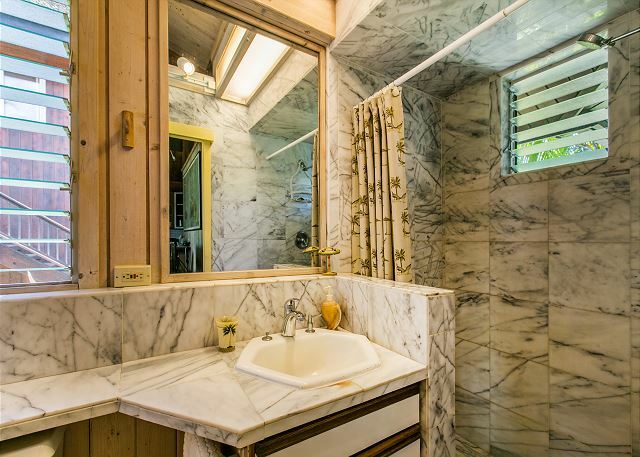 The home was clean and had every convenience that you could possibly need for your vacation. Beach toys and chairs, well appointed kitchen, comfy beds with quality sheets and lots of space to spread out. The size of the kitchen made meal prep a breeze and when we didn't feel like cooking- Kauai Pasta was just a couple of blocks away. Wednesday night Happy Hour at the next door Oceans restaurant and bar provided outstanding ukulele concert. (get there early to get a table). The Property Management company was extremely responsive and the gift of a huge fruit basket was an unexpected treat. Wednesday at 3pm is the Kapaa farmers Market. Not to be missed. 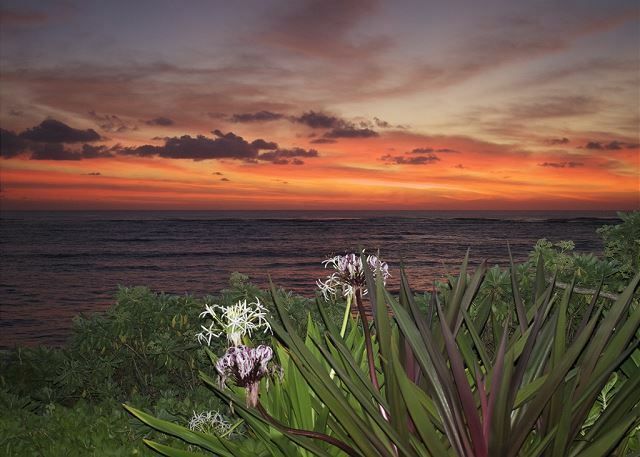 [review] => The proximity to Lihue Airport is wonderfully convenient. The house is directly on the beach. I would worry about small children and frail adults as the tide comes up to a bank which is a bit difficult to navigate. As we had no problem, it was wonderful to watch the sun rise directly on the water and go wade in the water whenever we wanted. Very comfortable beds but polyester sheets which were a bit hot. Towels and equipment were very nice. The main living space was spectacular and the kitchen was well stocked and easy for several cooks to work in at once. We would definitely recommend Niulani. [review] => Excellent location ON the beach and near stores. Big, roomy home with space and privacy for a large family. Lots of little extras like laundry products, beach towels and chairs...make vacation enjoyable. Issues: no air conditioning-if you can’t handle heat and humidity with a fan this house is not for you. It does cool off nicely for a few hours before dawn but not enough to sleep well. It’s the prime reason we would not rent it again. We had a child, a pregnant woman, and a grandma who struggled with it. The beds are FIRM. If you like that, you will be ok. I rented the main home and beach cottage. The place was wonderful and fully stocked. Enjoyed the homes location in Kapa’a. The rental company was organized and very responsive. Nothing could have been better. All was absolutely wonderful. Thank you for a memorable experience. [review] => This place was spectacular. We loved everything about it. [review] => Very good. Fantastic location. Enough room for 7 of us. Only critique, which don't think there is much the owner can do except by remodeling, is the backbedroom and lodge above garage bedroom feel stifled, not enough ventilation. Would help if you had bigger windows so can let more air in. Otherwise, the stay was perfect. [review] => Honestly felt like paradise when we walked in. This place is bigger than we thought it was going to be. The beach is small but really delightful with the small crabs that walk around. Everything was clean when arrived and quite wonderful. It does get a bit warm so make sure you open all the windows for that ocean breeze. This kitchen was spacious and the dining area was surrounded by windows. We utilized the cottage as well and that worked out great. We did hang a lovely hammock we had brought from home on the beach and had some small items out there overnight and everything was stolen so don't leave anything near the beach. I would think people would have integrity but obviously they needed it more so beware. Secure all items. Other than that it was nice, breezy place to stay. It is totally worth it to be right on the beach and to hear those ocean waves. 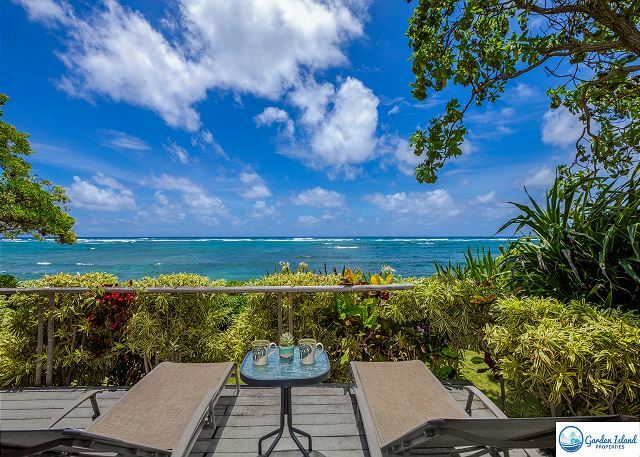 [review] => This oceanfront home has a beautiful view from the lanai and all of the amenities you could want. A huge entertaining kitchen is a plus, as is the "island" decor inside-- it's just a beautiful home. We also rented the cottage, which was really nice too--it has two lanais, and you can hear the ocean from the one off the bedroom. It was nice for one of the couples to have their own space. The only quibble is that the beachfront is not a swimming beach-- beautiful to look at but you can't really get in it. Really rocky and dangerous. But we rented bikes for the week (there's a place right on the corner to do that) and about 15 minutes up the bike path there's a wonderful swimming and bodyboarding beach: Kealia. There are other swimming beaches closer but that one was our favorite. Also the cute town of Kapaa is walking distance (and really close by bike)--lots of shops and restaurants. The ride to the end of the bike path by Donkey Beach is breathtaking as well. Other pluses: It's only 20 minutes from the airport; very handy to get to Poipu and the South Shore; not too far from the North Shore either. Very convenient for driving all over the island. Overall we loved our stay here and would come back in a heartbeat. [review] => Property as described. We had an excellent stay at the property. We rented the main property + the Bungalow and loft. The kitchen was very well equipped, the beds were comfortable and the house was kept very clean and the property itself was very well cared for. We did alot of swimming off the small beach (you need swimshoes and we used swimfins often). The beach is protected by a reef about 1,000 feet offshore, so the waves weren't too bad at all. We also enjoyed the paved bike bath that is by the property and runs a few miles up the coast. Kappa is a great town to vacation with shopping, restaurants and many great food trucks! The property firm was also excellent to deal with. Very responsive. [review] => We just stayed at the house (not the other units) and loved it. Great location for getting around the whole island. It was quite (not counting the surf crashing) despite being one block off of the highway. Checking in and out could not have been easier. One minor complaint was that the 2nd BR was hot and stuffy even with the fans, and there was no privacy from the neighbors next door. [review] => We fell in love with this house! It is literally just a few steps away from the beach and yet wonderfully  close to everything! We didn't spend much time there as there is so much to explore on such a little island  but we were out on the deck or the beach almost every evening and watched the perfect sunrise either laying in bed (right out the master window) or eating breakfast on the deck. We were worried about no a/c but it was definitely not a problem. The kitchen was well stocked though we wished they had plastic as we had kids and were worried about breaking dishes. The kitchen had everything we needed. The upper level is just a bed and dresser which we were assuming there was more but it worked perfect for the kids. My parents stayed in back house and loved it! perfect for the 2 of them. Overall the house was just what you want for a beach house, beautiful and unique without being stuffy. Tons of character and charm. [review] => The location of this property is perfect. 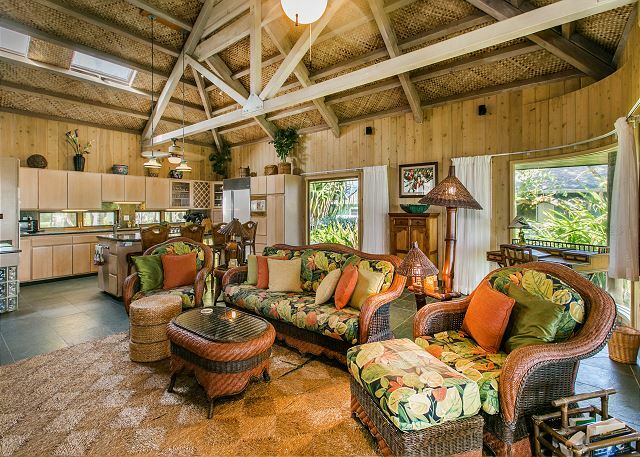 Right on the beach, within easy walking distance to Kapaa town and the popular Kauai Path. The house was very comfortable and with the option to rent the bungalow and cottage on the property, you can easily accommodate 4 couples with plenty of room. The beach house has a nice open floor plan to allow the entire group to gather for meals and socializing. Great deck area for whale watching. The upstairs loft in the beach house is very small and offers no privacy so we did not use that area, but it may work okay for older children if needed. Probably would not recommend for younger children since there are stairs involved. There was a mix up when we arrived so the cottage and bungalow were not ready for rental. This was quickly remedied by the rental agency. I would definitely recommend this property if you are looking for a place on the east side. [title] => Great beach house! [review] => We stayed over Thanksgiving week 2016. We rented the main house as well as the room above the garage. The house was wonderful. Everything we needed, we found. Everything was clean. There were a lot of beach options - toys, water shoes, towels, etc, to bring to the beach. The beach along the house is narrow and not really usable. That said the view is awesome! The location was great as it was a quick walk or drive to the store or restaurants. I would highly recommend this house. [review] => This was a great house. Our extended family of 6 people (5 adults-1 toddler) were very comfortable in this beachfront home. It's perfect location is steps away from the beach and just a couple blocks to groceries, coffee and ice cream. It's also a great home base to be able to explore the entire island. The home has all the beach gear you need (towels, chairs) and other amenities (cable, internet, bbq grill). The management company is friendly and willing/able to assist if you need them. I don't consider this a downside as we expected it but the house does stay warm at night (humidity/august) but we let the ocean air and the fans provided to keep us cool. We hope to come back and rent the rest of the property for a larger group/family gathering. [review] => We rented the house, the cottage and the bungalow for 10 days. There were eight adults and 2 children, and we had plenty of space, and loved the property. The description was very accurate, but even nicer than we imagined. It was very clean and well-maintained. We all love to cook, and enjoyed cooking in the beautifully appointed kitchen. Everything one could possibly want in a beach house was provided:  sand shoes, beach toys, chairs, towels, umbrella, and even some snorkel gear. An added bonus was the laundry room, with laundry soap provided. We snorkeled, scuba dived, zip-lined, hiked, explored Waimea canyon, sunbathed, and took an Odessey trip along the Napali coast. Our kids took us to a luau on a plantation but I've forgotten the name of it. We also ate at Shrimp Station and the Beach House Restaurant, all good. The location is very convenient---we went all the way to Barking Sands beach on the southwest, and all the way north as far as we could. [review] => We had a great time. It worked out well for our family of nine. Besides my husband and myself, we had  three adult children, their spouses plus one grandchild in our party, so the addition of the bungalow and cottage were perfect for us. We saw whales from the deck and the house is located on a walking/bike path which was nice. The baby beach that was located very near the house was not the cleanest, the sand was littered with debris. However we did get to enjoy watching two Monk seals that came and rested on the beach each day. The volunteers that kept people from getting to close  were friendly and great to visit with each day! Garden Island Properties also allowed us a late check out which was really appreciated since our flight did not leave until 11:00 at night. This made our last day on the island much more enjoyable. [review] => Because the house is right on the beach that was not frequented by people, there was a lot of privacy. At the same time, it was very close to stores and restaurants on the main road so it was very convenient. We did not hear any road noise. The only constant noise was the ocean waves. It was awesome. Some of the windows were difficult to open but other than that, we have no complaints. [review] => I would be very happy to move in permanently. Great location and ambiance. [review] => We stayed at the house for a week this January. 6 adults and 3 kids. We were very happy with our choice. The house is amazing. Very nice large kitchen for the entire group. Plenty of space in the house and quite kid friendly. You are only a chip shot away from the beach. Which we were thrilled with. The sand was perfect for the kids. Not a beach where kids can wade in but a baby beach is a couple minute walk to. We went there once because we loved ours. Snorkeling/swimming(with water shoes)/paddle boarding is great right there. Everything you need is a short walk/drive away. Kauai is paradise and we will be heading back and this place will be first on our list. Can't wait. Mahola from our family! [review] => We rented this beautiful property while in Kauai for a wedding. It was the perfect place to gather and watch the sunrise or to go snorkeling with the gear provided at the house. The kitchen was well stocked and it was close to everything we needed. Thanks! [review] => The house and location was excellent. the beds and pillow were substandard- particularly the master. It was like sleeping on a rock!! it made it  hard to love the rest - but it was really nice. the upstairs apartment felt like furniture was missing. [review] => Very nice home and lovely beach. Worked extremely well for our family. Well stocked with beach chairs and towels. Would rent again. RELATES TO ALL PROPERTIES. PLEASE READ THIS CONTRACT CAREFULLY. BY CLICKING ON THE ACCEPT BUTTON YOU (either an individual or a single entity) AGREE THAT THIS AGREEMENT IS ENFORCEABLE LIKE ANY WRITTEN CONTRACT SIGNED BY YOU.